Our sophisticated electrical testing equipment and reporting enables us to get to the root of your electrical problem, and fast. 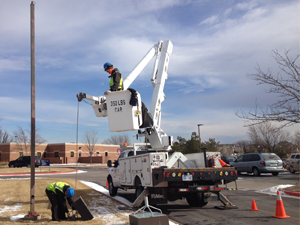 Meanwhile, scheduled commercial electrical service does more than just keep the lights on – it can save you money. Sometimes electrical challenges follow us home. Got an electrical issue at your residence? We troubleshoot and repair there, too, and also with the most modern testing equipment performed by professionally trained electricians. 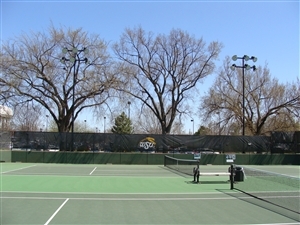 Young Electric is proud to provide service and maintenance to Wichita State University’s tennis facilities. 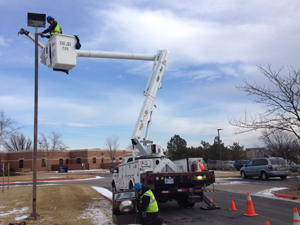 Older High Intensity Discharge (HID) parking lot fixtures are replaced with new energy-efficient and long-life LED's using Young Electric's late model, ANSI-compliant and company-maintained bucket truck.